Home Costs > How Much Does a Concrete Driveway Cost? Driveways can come in a variety of materials. A dirt or gravel driveway will be the cheapest, while an asphalt driveway will be a mid-grade option. A concrete driveway will be the most expensive option for most; however, it will also be the best in terms of quality and will be the most durable. The cost of a concrete drive will be between $4 to $15 per square foot, and this cost will depend on the length of the driveway, type of concrete, the complexity of the setup/foundation, the geographical location, and the contractor you’re using. Therefore, a driveway that is 1,000 square feet will cost $4,000 to $15,000 to complete. The more stable the foundation, the less likely the driveway is to crack and fall apart. Angie’s List says contractors who use the best material will often charge $7 to $10 per square foot. As mentioned in the chart above, the type of driveway can greatly affect the price. Heavier cars parked on the driveway will usually command higher prices. The longer and wider a driveway is, the more it’s going to cost. In order to get a fairly decent ballpark price, grab a measuring tape and measure the width by length. The way your driveway connects to the road can bring up the price. If the driveway doesn’t flush nicely with the road, it can bring the price up. How much manual labor is required where the concrete mixers can’t reach? How much work is involved in making sure the driveway drains properly? The more preparation needed, the most it can cost. If your home is more than 25 miles from the nearest concrete plant, a mileage surcharge, along with higher contractor fees will more than apply. Most concrete companies, when estimating your job, will include all job levels. This includes breaking up and disposing of the old driveway, laying the foundation, and pouring the concrete for the driveway. Concrete driveways should be laid using proper drainage techniques to ensure the no water sits on the driveway. Concrete driveways should also have stress cracks, usually built in a rectangular pattern, to aid in the expansion and contraction of the concrete in different temperatures. During the procedure, the contractor will remove all the vegetation and grass within the area where the driveway is to be installed. Once removed, wood planks will be set on the sides for the boundaries of the driveway. After the wood plank borders have been installed, the concrete will be poured by a local cement company. Under the concrete will be welded wires to ensure the concrete is staying reinforced. Once the cement has been poured, workers will level the concrete and let it dry overnight. You should be able to use the driveway within a few days. If you would like a special border, such as brick pavers, this will be an extra cost. This can be an additional $2 to $6 per square foot, depending on the finish. Some companies do not include the breaking apart and disposing of the old driveway and may charge extra for this service. Adding stains, a stamped finish or another type of finish can add to the final price. While optional, these finishes will just add a decorative touch. This can cost an additional $1 to $2 per square foot. Don’t forget about repairs in the future. Resurfacing, which can replace the top layer, can often cost $200 to $1,000, depending on the damage done. Another repair, such as replacing the cracks, can cost $300 to $600, depending on the scope of the project. Power washing and sealing can be another $500 to $1,300, depending on the size of the driveway and the type of sealer being used. Heating your driveway, which uses a boiler system and flexible tubing, can increase the costs by $4 to $9 per square foot. On average, a concrete driveway can last anywhere from 25 to as long as 50 years. This is going to greatly depend on how well the driveway was built. Out of all the material that you can use, concrete tends to be the best. Aside from concrete being a durable material, there are also many decorative options available. These decorative options can give your driveway an appearance that different than most. Once a concrete driveway has been laid out, it’s best to lay a driveway sealant every year to ensure that the driveway can hold up to things such as harsh weather and salt. How many cars do you want to fit in the driveway? How wide do you want the driveway to be? Do you want it to be one car wide? Two? Three? How far away is the house from the main road? It’s important to remember that widening a driveway can add onto the total cost. What type of shape do you want? 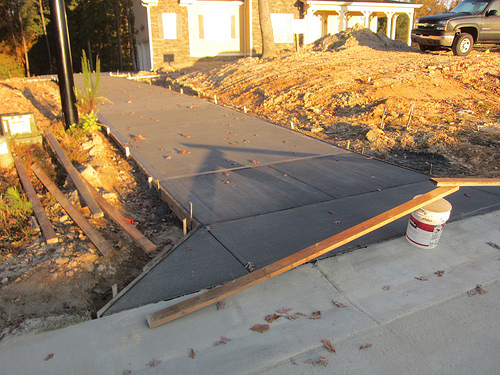 Concrete driveways can come in all shapes and sizes. A simple square driveway will be a lot cheaper than one that is curved and designed differently. What type of concrete is going to be used? Concrete can come in different qualities. Make sure that the contractor is using concrete at least 2800 PSI. Portions, or all, of a concrete driveway job, can be done yourself instead of hiring a company. If the cost of concrete is a problem, consider asphalt as a cheaper alternative. When comparing the asphalt vs concrete driveway cost, you will spend closer to $2 to $4 per square foot for asphalt. Keep your driveway simple. If you want to have decorations and stains, the price can surely go up. But, if you stick with the simple concrete, plan on being on the lower end of the quotes. Use services such as Service Magic to find a contractor in your area. When you use a service such as this one, you will get quotes from many contractors in your area who can perform this job.